Email is the most personal, engaging and effective media in the digital era. You see, email can be your most personal, engaging and effective medium when you “work it.” That is, you set it up to engage the reader. You flip on the marketing automation switch. Wait. Don’t go running scared from this article now if marketing automation sounds like an MIT course you don’t want to take or the first movie in the Planet of the Robots series. 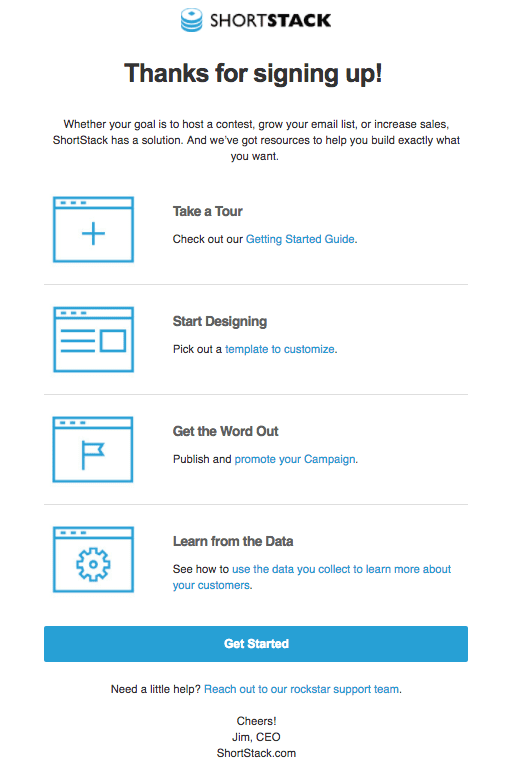 Getting started with marketing automation is as simple as creating a welcome email series. A welcome email series is a pre-written sequence of email messages queued and scheduled to send to someone who opts-in. Yes, it’s automatic. No, it’s not a threat to humanity. On the contrary, it makes your email marketing more, well, welcoming. What happens as a result of someone opting-into your email list (or one of your email lists)? Far too often, not much. In an effort to gather good examples of autoresponder welcome emails to share with you in this post, I have opted-into about 25 email subscriber lists the past few days. I was shocked to find most of the time I was not sent a welcome message. InboxArmy claims the majority of brands send welcome emails. That didn’t ring true for me. A new subscriber might be served a thank you page, which of course, is a nice touch and can be very useful. Similarly, they may see a little thank you note triggered as a pop-up. Then what? If your email marketing program is setup to simply deliver newsletters or blog update notices, the reader may not hear from you again soon. If a week—or even a few days—go by between opt-in and your first subsequent contact it could very well feel like a “cold call.” When the email arrives, your new subscriber may have no recollection of ever signing-up. Therein lies one of the beauties of the welcome series. When someone essentially tells you “You have permission to send me email,” that’s exactly what you do. You give them a nice warm welcome. A shout-out to VerticalResponse, who published a post listing seven reasons to deliver welcome email. Provide immediate value—A welcome email series instantly sets the tone and demonstrates your company is a reliable source of valuable content. Save time—It’s easy. The work is done in advance, once, and everything else is handled automatically. You’ll spend less time creating individual emails. Generate buzz—Welcome email can get prospective customers excited about what’s to come, which in addition to helpful content might be special offers. Win customers—Welcome email strike when the iron’s hot, right? The recipient wants—and gets—something. During this initial romance period subscribers are more likely to make a purchase. Easy personalization—Your email lists can be divided into different groups and you can customize your welcome emails to meet the needs of each (per location, gender, interests, etc.). 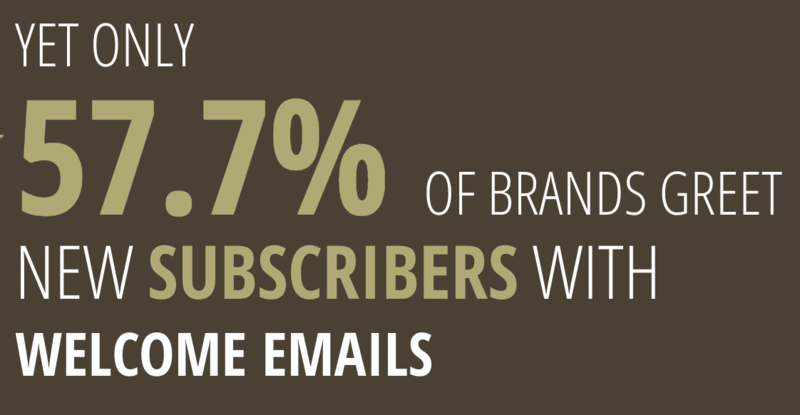 Stronger engagement—Subscribers pay more attention to welcome emails. You’ll see your open and click-through rates escalate significantly. Data presented by Inbox Army (credited to Experian Marketing) makes a strong case about the effectiveness of welcome email highlighting that it boosts open, click and transaction rates in a big way. How do you get started with a welcome series? Every brand is entitled to, and should, tackle their email welcome series the way they want. So no two welcome series are likely to be the same. However, the process of planning it should be. What’s the first thing we could say to make the recipient feel welcome? How might we better acquaint the reader with our brand, products, services or content? How can we win their business? An email template helps make the process of getting started with your welcome email series easier. 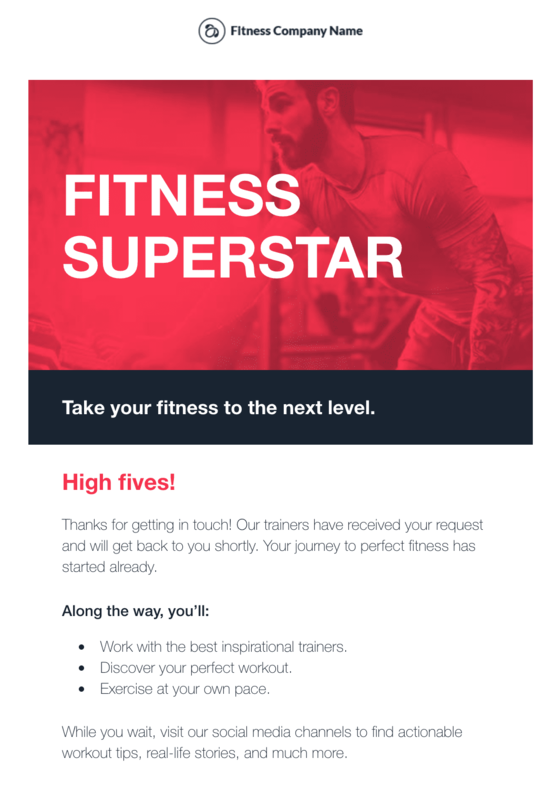 Many of the marketing automation platforms will even provide industry-specific templates, such as the fitness example above from GetResponse’s robust template library. At Orbit Media, we created a simple three-part series. If you plan to follow-up with a focus on content, you’re welcome to use this approach as your template. Email #1 is delivered immediately and says (1) thank you (2) here’s what to expect and (3) whitelist our address. Email #2 sends a few days later and aims to compel the recipient to click-into our blog by featuring our most popular post. Say hi, thank you and avoid any sales pitches. Share content that’s proven to be helpful (with a little dose of social proof). Demonstrate our “teach, not preach” approach to content marketing with an ace card, one of our top tutorials. As you can see, this sequence is not long or complicated. Nor is it transaction-based or pushy. The only thing offered is our expertise, which is free. I should add, because Orbit subscribers are added to a master list, they’ll also receive bi-monthly newsletters, which feature our best marketing advice (blog posts) and event notices. Notice our thank you page says as much and also offers a welcome video. In an effort to bring you a useful series of best practices, I’ve dug into a substantial number of posts, research reports, and ebooks about the making of effective welcome emails. Consider tossing some love at your new subscribers in your first auto-responder or a series of emails. Acknowledge the reader with a warm welcome. You can do so with the subject line, headline, opening line, or all of the above. 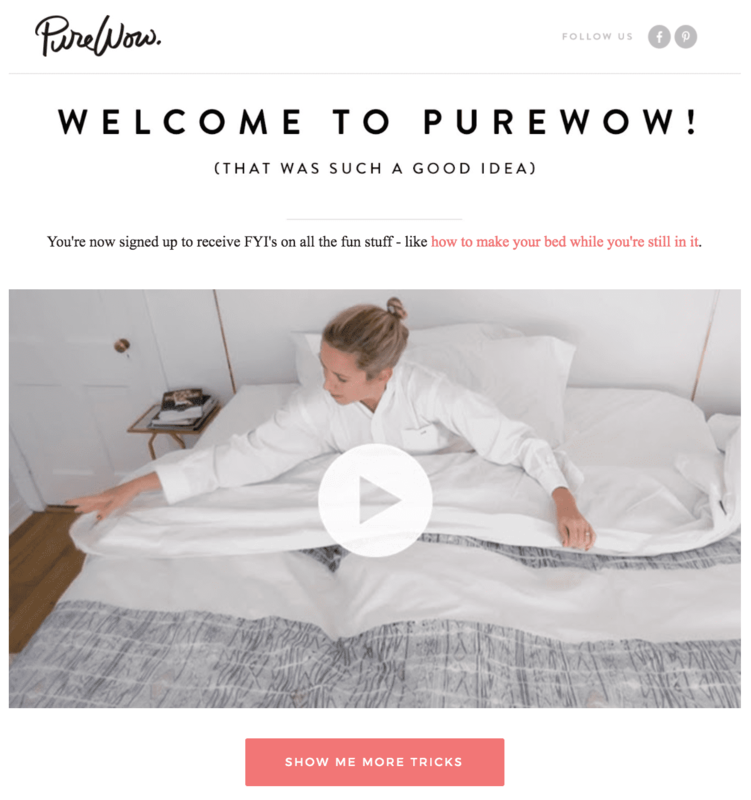 Check out the affirmation weaved into the PureWow welcome email below with the parenthetical subhead (“That was such a good idea.”) It’ll do you good to confirm your subscriber helped him or herself by joining. Show your appreciation too. You can do so with an offer or a simple thank you. Set the table a bit and whet your reader’s appetite for future emails from your brand by telling the reader what to expect. You may have done so already on your website, but there’s no harm in doing it again. If you have the resources to read all your responses, I like the approach of simply asking an open-ended question to begin a dialogue. A question such as, “What is your biggest challenge with X?” can work well. Tell your reader you’d like to connect in channels beyond email. Is your brand active on one more social networks? Mention that. Here’s a nice touch from clothing brand JackThreads, who not only promotes connecting on Instagram, but offers reasons why. Follow @jackthreads on Instagram for sneak peeks, behind-the-scenes views, and our most double-tappable looks. Do you offer free consultations? Do you have plans to make an appearance at an event? Do you host Twitter chats or webinars? Let your readers know how—and why—they should connect with you. Any brand can create “members only” perks. If you sell off the page, it’s easy to offer special deals. If you don’t, you might offer access to exclusive content. Be smart about converting new subscribers to customers by helping them get started. If, for any reason, getting started may sound tricky or challenging, address their fears with simple directions and/or helpful resources. If you happen to be hiring, recruiting partners or affiliates, a welcome email is a great way to put the word out. Most brands are finding the simple “subscribe to our newsletter” approach to list building is getting harder and converts at a very low rate. As such, they offer a lead magnet to increase conversion. Whether your offer is an ebook, assessment, research report, mini-course, coupon, or what have you, your first email should be a quick thank you along with the fulfillment of your offer. In addition to, or in place of, the lead magnet strategy, you might deliver a welcome email that announces a compelling offer such as free shipping, a bonus, discount, or some other incentive to take action. 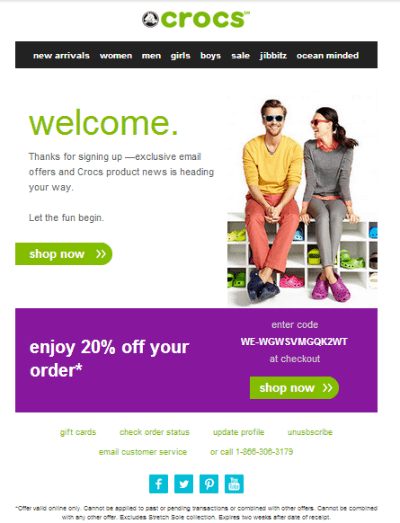 When Crocs responds to new subscribers for the first time its welcome email includes a 20% off coupon code. Your welcome email might make readers aware of a new product, a seasonal special, or any product or service you want to feature. Presenting your “most popular” offerings works to introduce social proof and inspire interest. Your subscriber is new and possibly excited about engaging with your brand. It could be the ideal time to ask them to tell their friends. 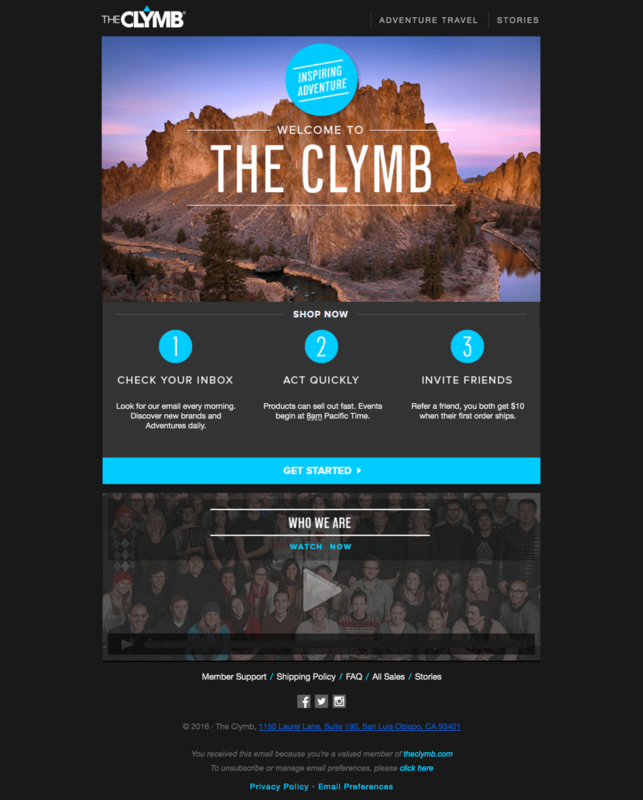 A welcome email from The Clymb asks readers to “invite friends” and sweetens the deal with $10 savings for the both the referrer and friend. Did I mention this is automatic? Again, the first few messages your new subscribers receive are crucial for setting expectations and making a connection with your brand. That’s a lot of touches you otherwise would not have made and your small investment of time compounds every day going forward. Really good stuff Barry. I have a “thank you” email, but I’m clearly not using it to its full potential. I’m going to change that! Thanks for the great ideas. Great suggestions — will see if I can set these up on our system! I like a lot of these email templates. Do you know who did these? Yes, they are strong examples. With each example presented the brand should be obvious. As for which company each brand uses for their email service provider, I do not know. I read 49% use MailChimp, so I suspect they have good templates. I’m a fan of GetResponse and CampaignMonitor, two companies I’ve enjoyed working with.